Step behind the curtain with Bey, Jay, and Blue Ivy. 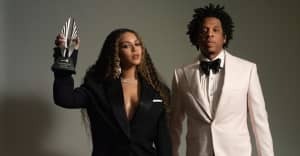 JAY-Z dropped his "Family Feud" video over the holidays and recruited his own superstar brood to co-star alongside him. Beyoncé and Blue Ivy are among the famous faces that pop up in the visual alongside cameos from ameos Michael B. Jordan, Jessica Chastain, and Thandie Newton among others. Shortly after director Ava DuVernay shared her own story from the shoot, Beyoncé too posted some BTS shots. The images include Bey in her regal blue gown, a selfie with JAY-Z, and a candid picture of the rapper and Blue Ivy.